Life’s little annoyances—surging gas prices, government shutdowns, password hacks—aren’t life-ruining on their own. 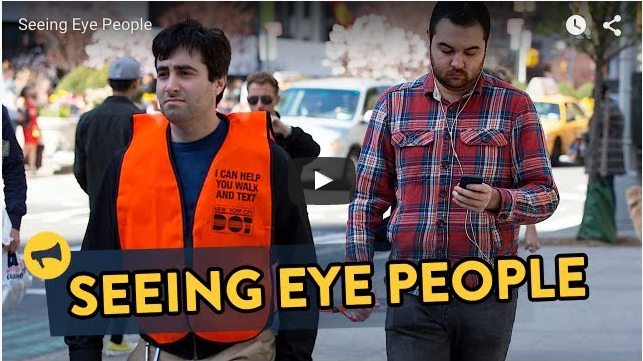 But to ignore them would be dangerous. They’re emblematic of bigger things at work. Ruinous things. A bank overdraft fee, for example, is a small bite from a huge, global financial system that was created solely to make money off of you. And it’s not like you can bite back. These huge forces—banks, pharmaceutical companies, health insurance, our political system—have so much control over our lives. Yet, we have little ability to control them. Or to even complain when things are broken. You can always contact customer support, but even if they solve your personal issue, the system that created your problem still exists. The cycle will continue. If customer support doesn’t solve your issue, then your next step might be to complain online. 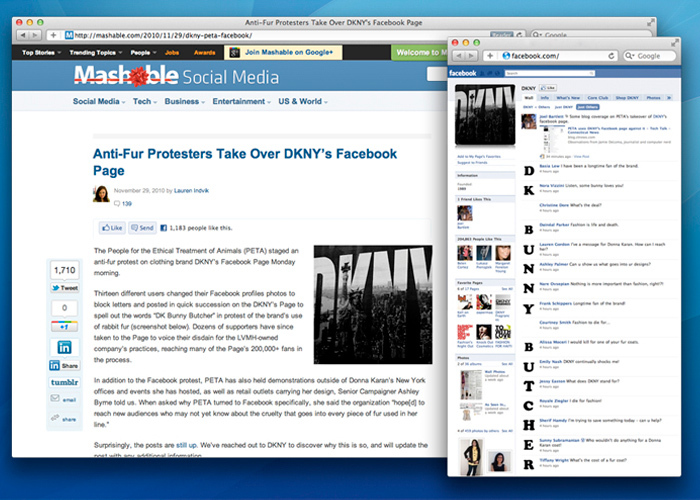 But, while battering your keyboard for 30 minutes can feel great, social media rants don’t often change the system. Out of the 879 million annual complaints lodged against brands on social media networks, at least 289 million are ignored each year. We need a better way to complain. Jeff is something of a mastermind at complaining. Whether he’s frustrated about too many tourists in NYC or the NSA listening to our conversations, Jeff turns his complaints into something way bigger than 140 characters. He complains by designing things—statues, websites, hipster traps, videos—that bring attention to the issue and galvanize change. The greatest measure of Jeff’s success hasn’t been institutional change...yet. His projects get other frustrated people to band together, stop feeling powerless, and start taking action. Change takes time and dedication. His projects act as a catalyst. Jeff's art connects people and gives them new ways to explore solutions that often expand and take on a life of their own. Letterbombing, for example started in NYC with Jeff and a few advertising peers and has now been used by non-profits across the world to raise awareness for issues ranging from autism to animal cruelty. When you want to complain, why not just go on a rant on social media, why actually make something? There is a quote from James Murphy of LCD Soundsystem, “The best way to complain is to make things.” For me, that means when there is something in the world that irks you or that you think could be better, there aren’t a lot of wonderful things that happen from simply venting. But if you take that energy and create a project from your frustration, now you’ve put something new into the world that people can react to and be inspired by. Maybe what you created is a solution to the thing that bothered you. Or maybe it’s just a way for other frustrated people to share a laugh or knowing nod with one another. I think projects that inspire people to participate can lead to a solution. It can lead to a startup, a reform, or a community of empathizers that can solve the problem. Is the ultimate goal of these projects to bring about a resolution? I wouldn’t suggest that the projects I’ve done are actual solutions but they do allow people to empathize, and from that empathy, something positive can come out. It’s about possibilities. When I was a Creative Director and had people reporting to me, it was frustrating to hear complaints from people who didn’t also come with some sort of a solution. There’s not much I can do in reaction to a simple complaint, except say, “I’m sorry you feel that way.” It doesn’t have to be the solution, but if you come with even one idea of how to solve it, we can start the riffing process. Your projects complain about some deep-seeded issues, and of late they are pointed at the U.S. government. How do you hope the institutions you complain about will respond? In general, I’m not expecting a reaction from any kind of authority. I mean, of course, I would love it if the government looked at our NSA project and said, “You know, we should really stop spying on Americans. It’s really not right.” [Laughs.] But that is an unrealistic expectation to have from an art project. I’m more interested in getting other people thinking, “Hey, I want to raise my voice too.” I don’t think any one project is going to make a brand, government, or municipality sit up and take notice. It requires other people’s voices too. 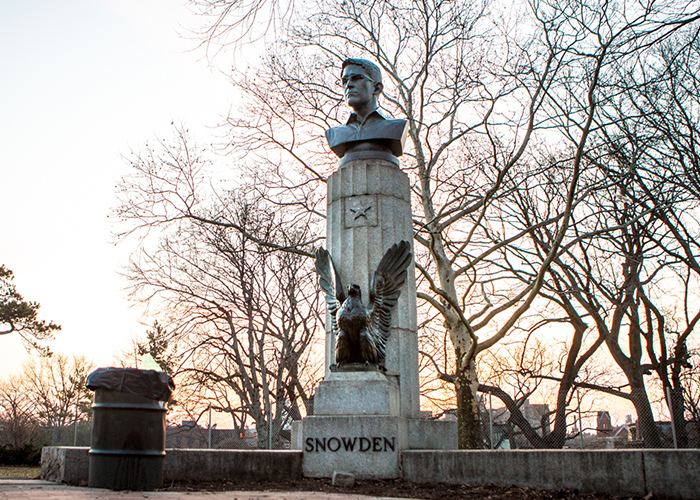 Like when our Edward Snowden statue was removed by the police, another group of artists came back that same night and “reinstalled” the statue as a hologram. We didn’t coordinate with them. We had no idea who they were. But the fact that they were so inspired by our work to make their own project was rewarding. When people are moved to become more educated, more involved, do a project on their own, write a letter, run for office, or even just register to vote—that is the level of success I am after. You’ve used spray paint, sculpture, websites, video, and group hacking to complain. How do you decide which medium to use to get people to pay attention? I think the project decides the medium. As for getting people to pay attention, it is not easy. We live in an age where even the unexpected is expected. People are making videos for everything today, even wedding proposals now have to be unique. When the whole world is full of surprises it becomes harder and harder. I still maintain that a simple, clear idea will cut through. Put something out there that is both unexpected and that people can relate to. Good ideas have friction. They might offend some people and inspire others. Also, I’ve done projects that I am pretty satisfied with that, in the scheme of things, almost no one has seen. But I still felt good about the process of making something. 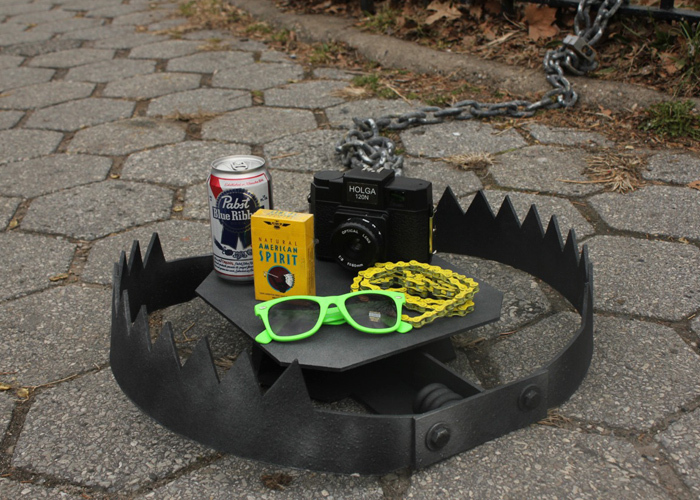 A Hipster Trap in McCarren Park, Greenpoint, Brooklyn. You use a lot of humor in your projects. Is that something you recommend across the board as a way to engage people? I use humor because it is a tool I have from doing improv and other things. Also, I’ve learned the hard way that anger doesn’t work well to bring people into your cause. If I want to change people and get them involved in a scene or revolution, it’s been better for me to use positivity than anger. Anyone who knows me, knows I am not a positive guy. I’ve just found that when trying to build something people respond to creativity, to cleverness, and to humor. Take the Occupy Wall Street movement, for example. It was easy to get into and was open to everyone. But it was hard to understand. It was hard to understand what the main goal was. We knew what they didn’t like but we didn’t know what they wanted in particular. And, it was very angry. And it needs to be angry, I get it, but you can’t lead with it. On the other hand, “Change” and “Hope” and other empty words don’t do anything either. There is a middle ground to find. What are some examples of that middle ground? Look at John Oliver. He gets people to sit for 15 or 25 minutes while he picks apart an issue and its consequences. The nightly news is not going to do that. They might talk about it for 60 seconds. But John Oliver says, we are going to sit down and examine this thing and we are going to make it funny. You have to do it in a way that both educates and entertains people. That combination is important. Another person to look at is Abbie Hoffman who was a revolutionary and a prankster in the 60s. He was able to galvanize public support because he made his form of chaos pretty fun. The projects that will change things in the world come from people like this. It isn’t going to be a 10-page take-down piece in The Washington Post because it’s too long for people’s attention spans today. Lots of complaints today are about brands and companies who deliver poor customer experiences or bad customer service. Customers feel helpless so they vent online—which doesn’t result in much more than an apology. Do you think making projects about their frustrations can help customers feel less powerless? Absolutely. Once you’ve made something and put something into the world, there is a great feeling about seeing something that didn’t exist before and knowing you had a hand in it. Then the added bonus is if people react. They can find a community of people who might want to help. This would never have happened unless the idea was out in the world. So, I think someone who is feeling powerless can gain a lot of power, momentum, and authority by putting their idea out into the world. As for companies that are not caring about customers... Many companies have really lost sight of what they are about. First and foremost, you are supposed to be a customer service company. If you are an airline, you are a customer service company with airplanes. If you are a rental car company, you are customer service company that has cars. If you are a restaurant, you are a customer service company that has food. But, today I do not think that companies consider that. First you are customer service company and until you can master that, you don’t get to go to other levels of success. You are always playing catch-up. How should brands respond to customers who make a project about them? Take the United Breaks Guitars video, for example. Hopefully they would listen, but look at the United Breaks Guitars example. This guy had to make a video because he’d already tried all the traditional channels to get satisfaction. What a lost opportunity for United. If they had just responded to his initial complaints, the airline could have made their own great video project about how they got a new guitar for a customer. But instead, he had to make a video about how they ruined his guitar. After he made the video, they should of course apologize and try to make it right. * More importantly though, and it would seem they haven’t done this, they could have used his complaint as an opportunity to ask, “Where did we fall down here, where were all the opportunities we had to fix this guy’s guitar, to fix his situation, and to make him a customer for life?” That would have been a great learning experience. But they’ve since broken more guitars. My gut says, this airline doesn’t really care about its customers. *Note: It has been reported that United Airlines Head of Customer Service called Dave to apologize and asked to use the video in their training. Also $3,000 was donated on his behalf to the Thelonious Monk Institute of Jazz. The “Yes, treat me like scum” button clicks through to American Airlines’ reservation page, an airline where Jeff had a negative customer experience. You grab lots of real, lasting attention from the communities you are speaking to. What can brands learn from your projects on how to better engaging and connect with customers? What brands can take from my projects is the success of coming from a clear point of view. I think a lot of brands are lukewarm on their point of view. They just tell us what they sell: cars, food, clothing. Consumers don’t know why these companies exist. There are thousands of companies with hundreds of thousands of brands and so many lost opportunities to connect with their customers on a human level. For instance, a credit company that sells itself as “We are a credit card with #percent interest” could instead do an advertising project where customers participate and learn about how they look at the world when it comes to money. Brands don’t have to save the rainforest to connect on a human level. They can do something small and real that shows they care about people and that they care about a vision larger than what they sell. That is what me and my creative partner Andy Tider do with our advertising—we get companies to do something real and do ads based on the real connection they made. Bottom line, I think there would be a lot more energy between customers and brands if brands tried to connect more and knew where customers were coming from. Finally, what are you complaining about right now? The next project we are making involves the worst offenders in corporate America. It will raise money for the Bernie Sanders campaign because one of his pillars is to try and get corporate funding out of the government. These are companies that have really tilted the playing field so far in their favor that they don’t even have to break the rules because they make the rules. Somewhere out there is a large, powerful system that’s broken, and sooner or later it’s going to intersect with your life. You’ll need to choose: be silent or make some noise. As Jeff and others have shown, there is power in art and satire. And those are tools anyone can use to communicate the injustices and frustrations that affect us all. In fact, more and more people are turning to art, code, design, and comedy to catalyze change: United Breaks Guitars, Don't Throw My Package, and Ode to Comcast are just a few examples. If you follow in these footsteps, remember that it is unsure whether or not your project will solve the problem. What is sure is that you will be putting something into the world that people can react to, relate with, and build upon. Your complaint will be heard. Jeff Greenspan is one of the creative minds behind such projects as the Edward Snowden Bust, NYC’s Hipster Traps, and The World’s Most Exclusive Website. He has had many titles including BuzzFeed’s first Chief Creative Officer, a Creative Strategist at Facebook, and a Creative Director at BBDO. His accolades include being ranked as the 8th Most Creative Person In Social Media Marketing by Business Insider among other awards. He lives in NYC and works around the globe wherever his creativity is needed.